This is one of my special photos taken in the spring of 1955! 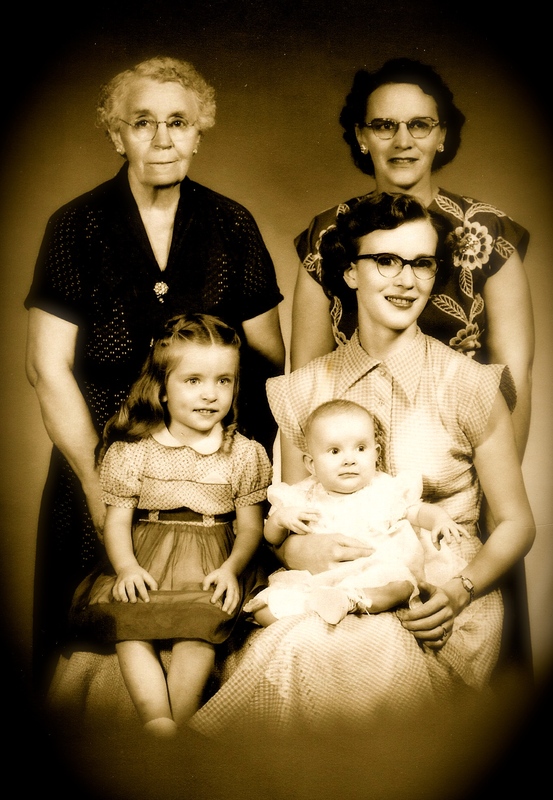 Four generations – of my mother’s family. Sadie Hendrix Morgan Naviaux, was my great-grandmother. Lucille Morgan Saulsbury my grandmother and Jean Saulsbury McTygue my mother! Sadie Hendrix was born in 1884 in Barclay, IL. I have a few fond memories of her. My grandmother Lucille Morgan was born in 1908 south of Overton Nebraska. I have lots of great memories of ‘Granny’. I met my husband because of her…..thank you so much! I am so lucky that we still have Mom! Take time to call your mother this week-end!